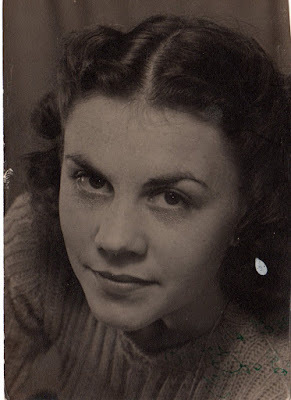 Mum (Enid Maude Hayden) was born in 1925; a teenager in World War II. This picture was taken before she started coloring her hair. At sixteen she worked as a "clippie" on the double-decker buses in London. "Who's got the best legs on the street and why have I?" Running up and down those stairs all day; no wonder! These were the times when London was being bombed, and she would take the train to London to meet some Yank she'd met and have to run home in the dark because of the lights out cerfew. 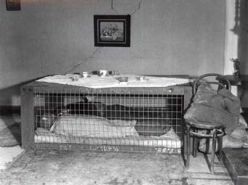 They had a Morrison bed in the living room and she had to dash to it more than once - a steel cage contraption with a mattress inside. Often, as this picture shows, they used the top surface for a table.